Slim, Slimmer, Acer Swift 7! The trend towards slimmer devices keeps going on. 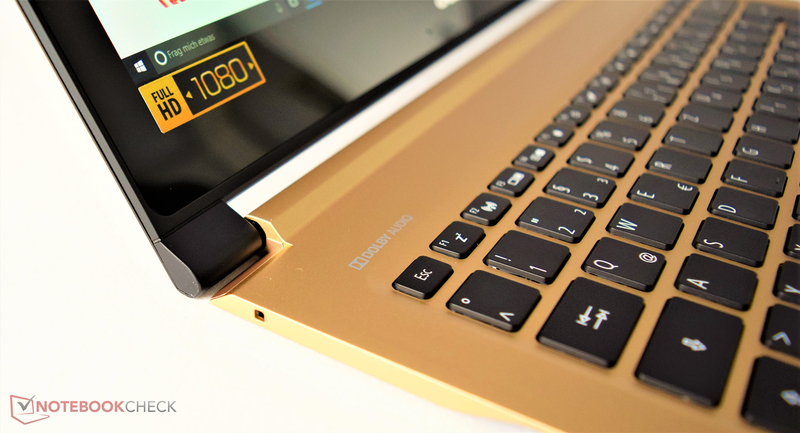 Acer has now created the slimmest notebook in the world: less than 10 mm (~0.4 in) thick. We will check to see how well the Kaby Lake dual-core SoC works in our review. Slimmer devices - manufacturers are constantly trying to bring the slimmest devices to the market. 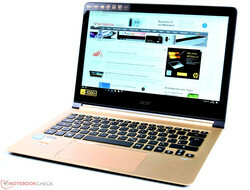 Acer has decided to produce the slimmest and lightest notebook in the world. This 13-inch model weighs a mere 1.1 kg (~2.4 lb) and is less than 10 mm (~0.4 in) thick, which makes it slimmer than the HP Spectre 13 (10.4 mm/~0.41 in). This skinny build has a few disadvantages: limited selection of ports and lack of space for 2.5-inch storage devices. The Acer Swift 7 uses a dual-core SoC from the current Intel Kaby Lake series. The processor clocks at 1.2 GHz and has an integrated graphics processor, the Intel HD Graphics 615. The system is equipped with 8 GB of DDR3 RAM and an SSD with a capacity of 256 GB. Acer has priced this model at around 1300 Euros (~$1359) and, at the time of testing, we did not find other configurations of this model. The Acer Swift 7 has to compete with devices from Apple, HP and Asus. All of these 12 to 14-inch laptops have conservative SoCs. The Acer Swift 7 looks elegant thanks to its colors. The top of the base unit is a stylish gold, while the display cover and the bottom of the base unit are matte black. 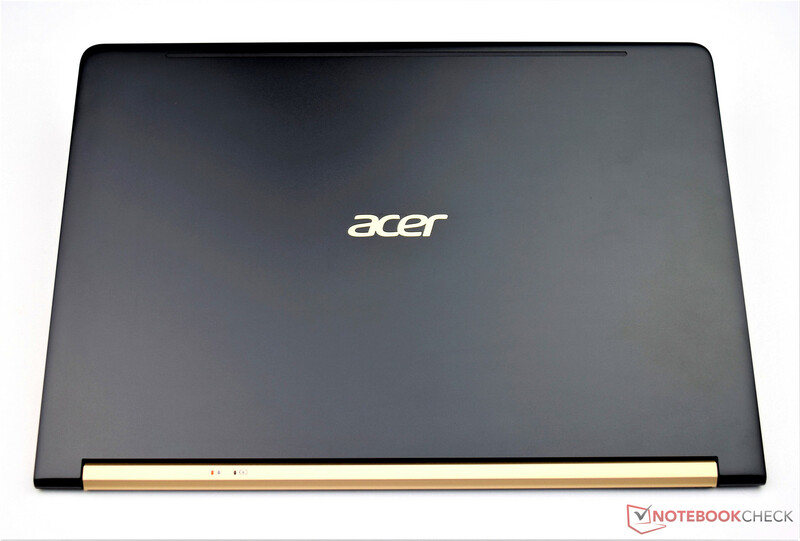 The design includes other gold-colored accents and rounds it all off with a nice Acer logo below the screen. Subjectively, we like the black and gold color choice. The case is made of aluminium and has rounded corners. It feels great and is very sturdy. We could not deform the base, but we could bend the display slightly. However, there is no reason to worry as the laptop is quite strong and one would need a lot of force to damage any part of it. Overall, we feel the case is sturdy despite being so slim. The workmanship of the Acer Swift 7 is flawless: no uneven gaps or parts of the case that creak. We can criticize one part of the Acer Swift 7: it is quite easy to leave a trail of smudges and fingerprints on the matte black surfaces of this model. 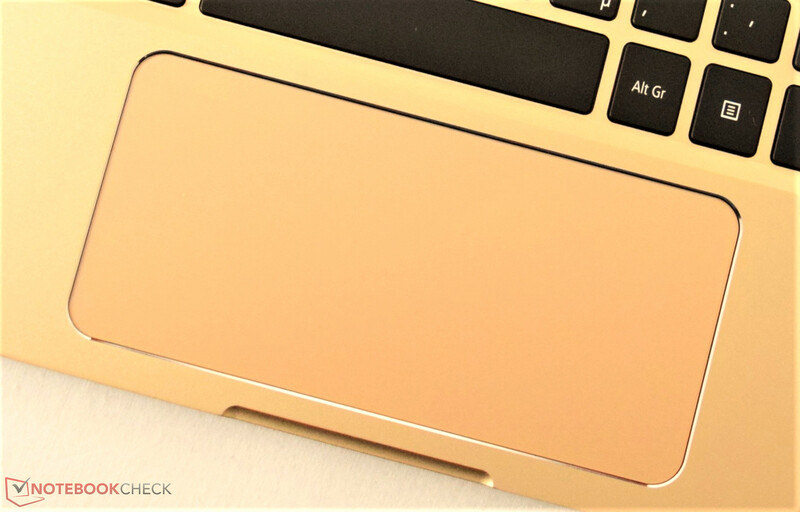 The gold surfaces are not as sensitive in this respect, as, despite using the laptop for a long time, we were not able to discern any fingerprints on them. Due to the flat and light build of the laptop, it is only possible to open it with both hands. The two hinges hold the screen in place without allowing it to wobble. If you push the display to its maximum opening angle, the laptop might tip over backwards. This is due to the base of the laptop being lighter than the display (which is protected by Gorilla Glass). The Acer Swift 7 is very slim at 9.98 mm (~0.4 in). In fact, it is (so far) the slimmest notebook of the world. The difference in size can be seen from our size comparison diagram. The Acer Swift 7 is a little larger than the Apple MacBook 12 (Early 2016, 12-inch format), due to its 13-inch format. Our test model is placed in the middle of the table with its weight of 1.1 kg (~2.4 lb). The HP EliteBook Folio G1 and the Apple MacBook 12 are slightly lighter. 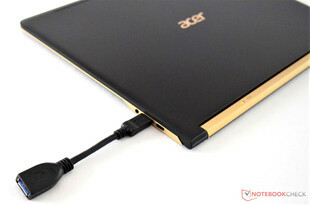 Acer has installed two USB 3.1 Type C ports and a 3.5 mm combo audio jack in its laptop. Due to the thickness of this model, it is not possible to add more interfaces. 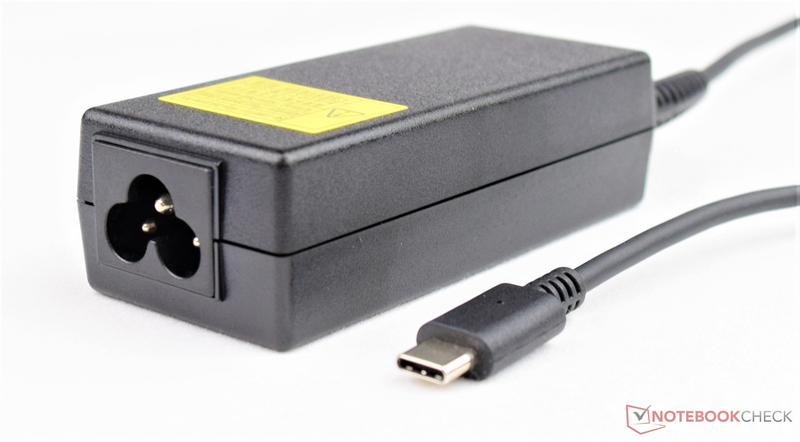 The two USB 3.1 Type C ports can be used to charge the laptop with the power adapter. The ports are positioned well towards the back of the right side. If the user needs to use other devices, an adapter will be required. 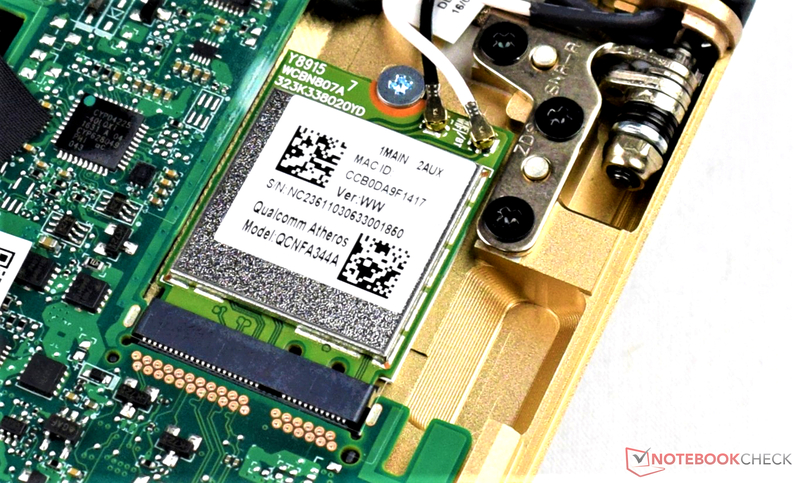 The Qualcomm Atheros QC61x4 WLAN module is used for wireless transmissions. 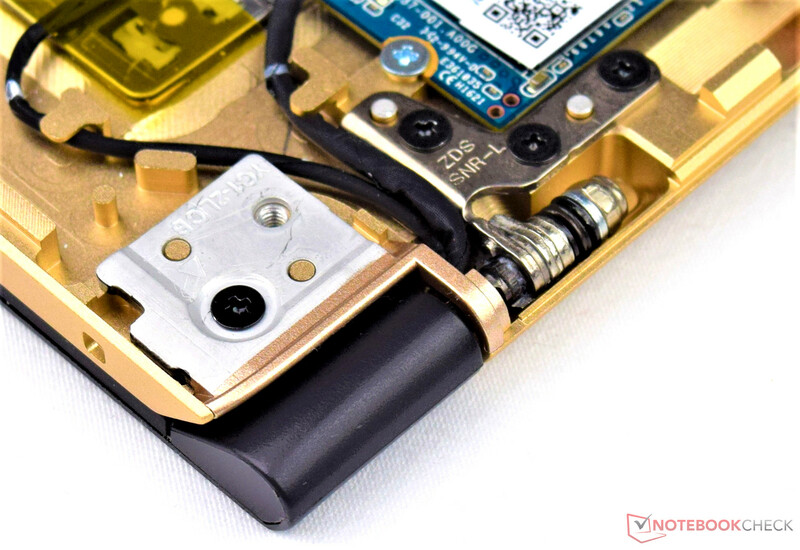 This module works on the 2.4 and 5 GHz frequencies and also offers Bluetooth. Theoretically, it is possible to transmit at speeds of up to 867 MB/s. 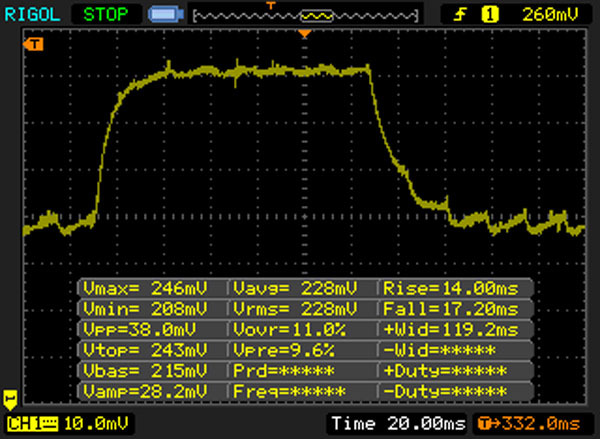 During our test with a reference router, we measured 673 MB/s (receiving) and 642 MB/s (sending). These values place our Acer Swift 7 at the top of the table. We did not have any issues with network connections during our tests. The laptop was even able to transmit large files reliably and quickly. The Acer Swift 7 is not designed to be a business laptop. This means that it has a limited assortment of security features: a ring ferrule on the left side (for a security cable to prevent theft) and the integrated Trusted Platform Module 2.0 (TPM). The laptop comes with an adapter for USB 3.1 Type-C to USB 3.0 (see picture). 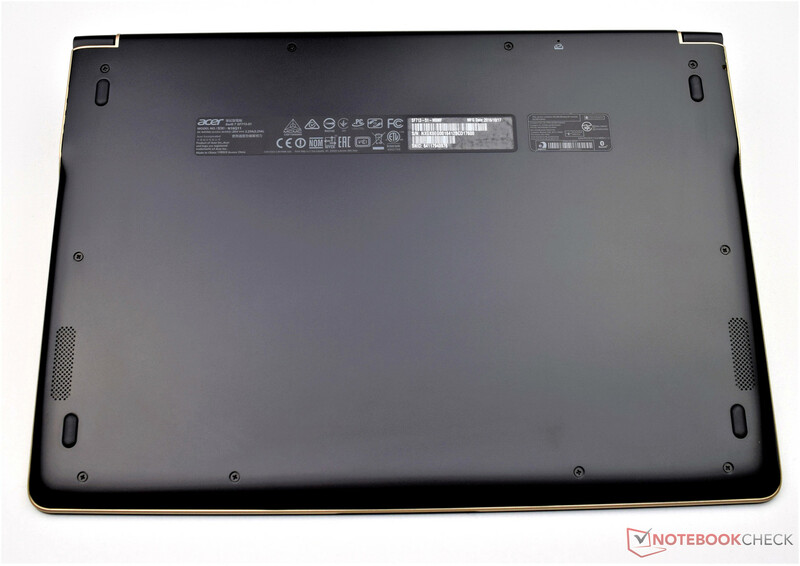 The manufacturer does not provide a sleeve for this notebook and we were not able to find any special accessories for the Swift 7 on the Acer homepage. However, it is possible to use the accessories from other manufacturers, thanks to the dual USB 3.1 Type-C ports on this model. The maintenance options for a fanless laptop are limited. The user can only think about upgrading the hardware of the laptop. 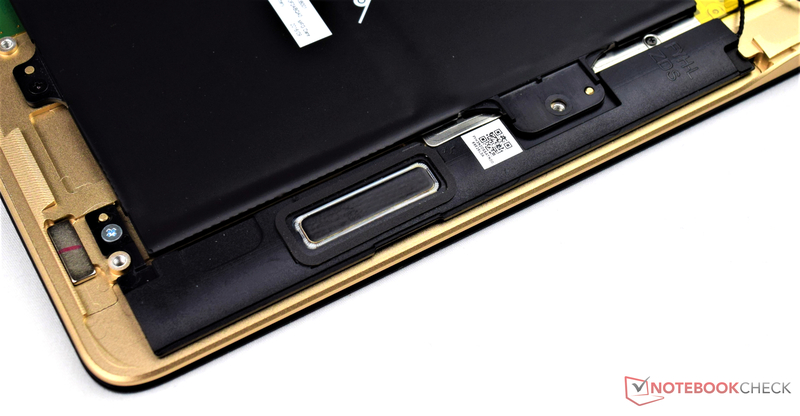 The bottom plate of the Acer Swift 7 can be taken off without any special tools. The inside holds a battery, which occupies around 75% of the case. Above it, the user will find the motherboard and the CPU and the RAM are below the copper plate. 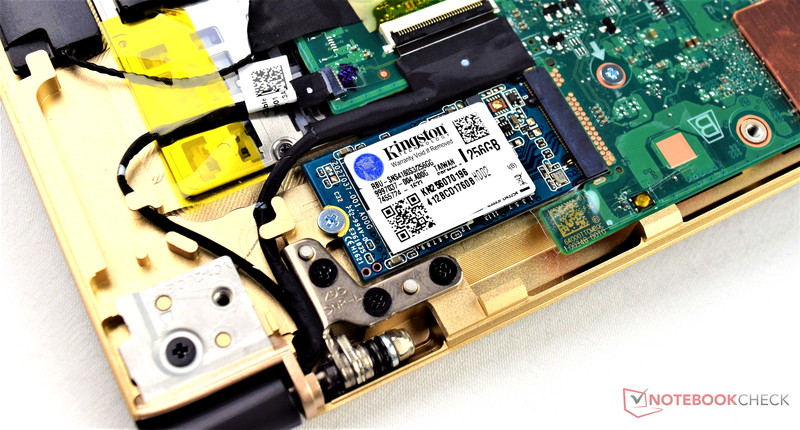 The WLAN module and the M.2 2242 SSD can be swapped out. The cover can be removed. Acer runs Windows 10 64-bit on the Swift 7. A look at the support page from Acer shows that this is the only OS that is officially supported in this model. Acer offers a 2-year manufacturer warranty for the Swift 7. We did not find any other options for this model. The keyboard of the Acer Swift 7. The keyboard has been lowered a little into the case, which puts it a little lower than the hand-rest area. The very short stroke distance detracts from the great feedback the laptop offers while typing. 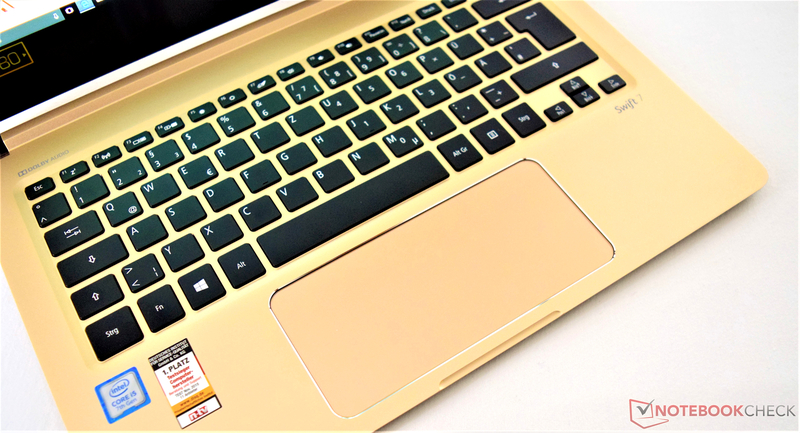 After a short adjustment period, the user can type fast on the Acer Swift 7. The keys are matte, average in size and have white lettering. In good lighting, the keyboard is clearly legible, but in reduced lighting conditions a backlight option would have been nice to improve legibility of the keys. A sacrifice made due to the flat build? HP has managed to install backlight for the keyboard in the Spectre 13. The function and the cursor keys are slightly smaller. Furthermore, the "Power On" button is on the top right side of the keyboard. We liked the keyboard, but a lighting option would have earned it more points. The touchpad of the Acer Swift 7. The touchpad is decently sized at 14 x 6.5 cm (~5.5 x 2.6 in). This allows the laptop to use the space below the keyboard optimally. The touchpad is the same color as the rest of the case. It is easy to recognize thanks to the slight border around it. 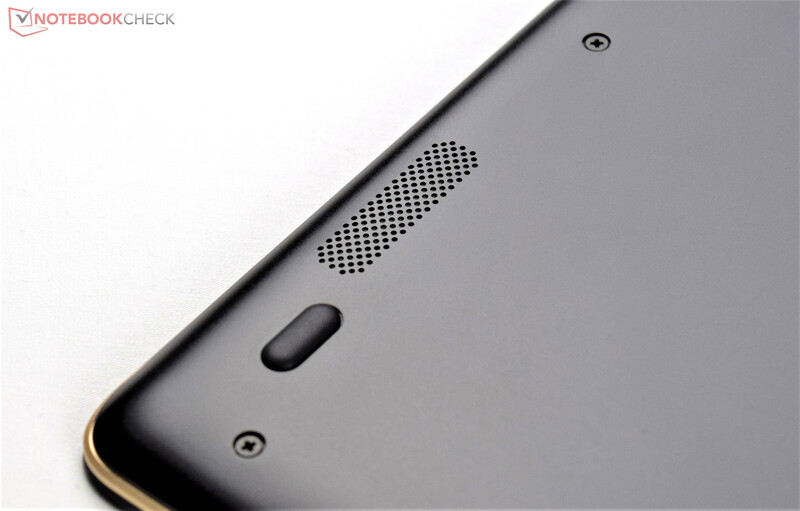 The surface is smooth, which allows the user to move their finger comfortably over the touchpad. Moist fingers will not have as good a time on this surface. The ClickPad provides good feedback when pressed. The stroke distance is short, but noticeable. 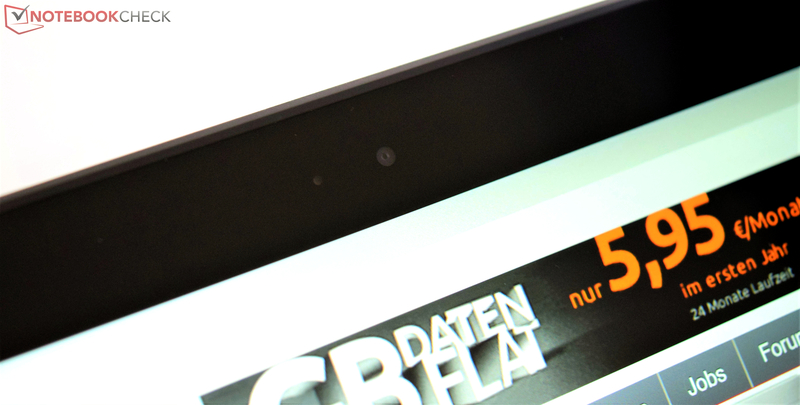 It is possible to click the touchpad easily in the bottom third of the device. Above this section, the user will need more force to produce a click. 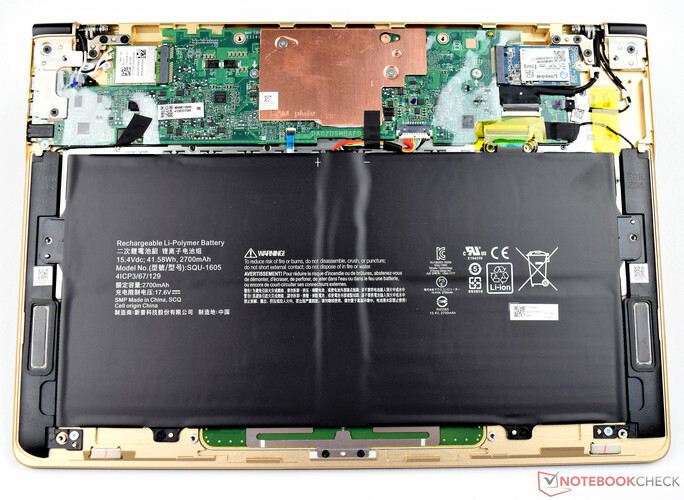 The screen of the Acer Swift 7 comes from Chimei Innolux. 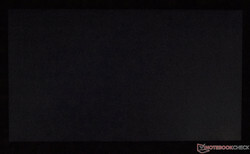 This is an IPS panel with a native resolution of 1920x1080 pixels. There are no alternatives offered for the Swift 7, but this is not necessarily bad. One look at the comparison table shows that the panel does a good job. 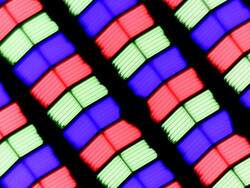 The standard FHD resolution for a 13-inch device is comfortable (166 dpi pixel density). For higher resolutions, the scaling would need to be adjusted as programs might have problems. 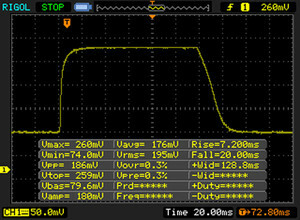 Our test model has a very good average brightness of 344 cd/m² (max. 359 cd/m²). The good combination of high contrast (1436:1) and low black value (0.25) ensures that colors are rich. This prevents scenes from having a grey tinge and allows the laptop to produce a nice black. Buyers will get a display suitable for the price tag. The illumination is very balanced at 92%. We did not encounter any issues with our test model, such as "Screen Bleeding". It is fun to work on the Acer Swift 7 due to the quality of the display. The colors are strong thanks to high contrast and low black value. Out-of-the-box, the DeltaE 2000 values are slightly raised (ColorChecker 4.57 and grey levels 5.2). A value below 3 would be ideal. However, this does not damage our overall good impression of the screen. We linked a suitable ICC profile, which allows us to get more out of the panel. The color space coverage of the IPS display produces good numbers. The sRGB spectrum is covered up to 89% and the AdobeRGB space is 58% covered. 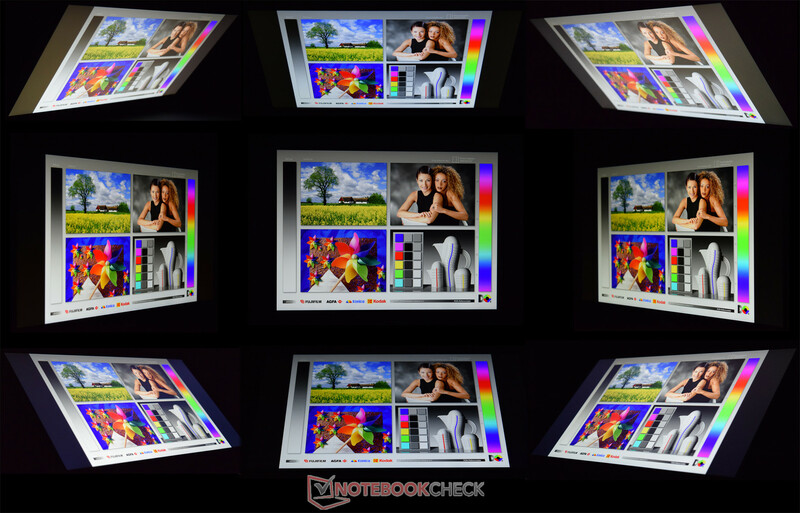 The sRGB space should be sufficient for designers and photographers. The viewing angles of the Acer Swift 7. The viewing angles of the Acer Swift 7 are good thanks to the IPS panel. If the panel is pushed forward, a slight yellow tint is noticeable. However, this position is impractical for normal use and as such, this deviation will not affect users. Acer does not use PWM to regulate the brightness of the screen, which means that we were spared any annoying flickering. We were surprised how well the notebook works outdoors. Despite the glossy screen, the Acer Swift 7 is legible even in bright surroundings. There are reflections on the display, but these are not as distracting as one would have thought. The high brightness of 344 cd/m² ensures that the laptop stays legible almost all the time. The only exception is direct sunlight. We recommend finding a shaded area to work so that the brightness can be lowered, thus increasing the battery life. 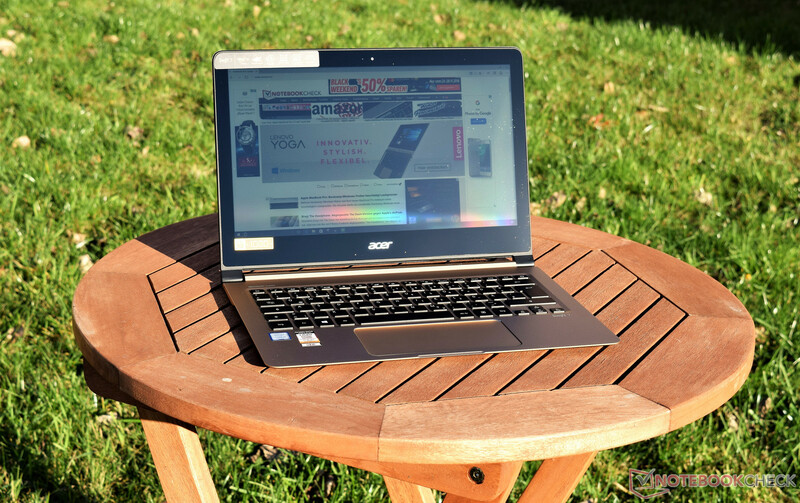 The Acer Swift 7 in a shaded area. 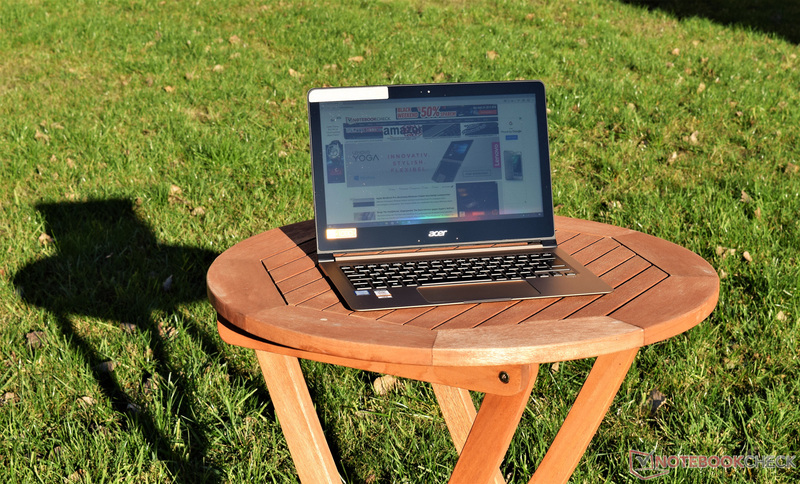 ... the user can work outdoors. This laptop is no power performer. The Intel Core i5-7Y54 is a dual-core SoC, which is specifically designed for tablets and passively cooled notebooks. 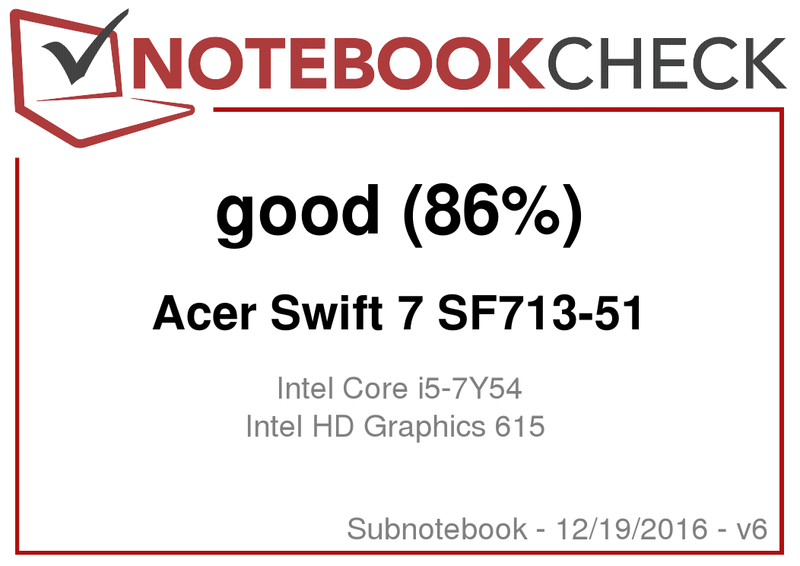 Nevertheless, the performance of this CPU suffices to run the Acer Swift 7 fast. The processor, which is based on the Kaby Lake architecture, can use the 8 GB DDR3 RAM of the system. This is more than enough, considering the performance of the CPU. The Acer Swift 7 handles typical office tasks very well. Video editing should be avoided, as the CPU is quickly pushed to its limits. The SSD of the system ensures that everything runs smoothly and loading times are short. So far, we could only find one configuration for the Acer Swift 7. The conservative SoC is placed under the copper plate. For this laptop, a conservative CPU is a must. The manufacturer has chosen the Intel Core i5-7Y54 dual-core processor, which is based on the Kaby Lake architecture and is manufactured in the 14 nanometer process with FinFET transistors. The base clock speed of 1.2 GHz can increase to 3.2 GHz, depending on the load of the laptop. The CPU boasts Hyperthreading, which allows it to simultaneously process up to 4 threads. From the comparison table, it is clear to see that both Acer models (Acer Swift 7 and Acer Spin 7) perform at the same level in Cinebench R15. The HP EliteBook Folio G1 takes a clear lead in the Cinebench R15 CPU Multi 64-bit benchmark. The reason for this discrepancy is immediately clear: our processor runs at a TDP of 4.5 W, whereas HP has raised the TDP value of their CPU to 8.5 W. This allows it to handle multi-thread applications much better. However, it also requires a better cooling system and it will reduce the battery life. The technical specifications hint at a smooth running system. On the inside of our laptop, we have a dual-core SoC, which can process up to 4 threads and 8 GB DDR3 RAM (running in dual-channel mode). An SSD rounds off the package. The system starts fast and the device is ready within a few seconds. In PCMark 8, the Acer Swift 7 can position ahead of the HP EliteBook Folio G1. The M.2 2242 storage device comes from Kingston. According to AS SSD, the SSD can reach a sequential read speed of 492 MB/s. For sequential write, we note a speed of 292 MB/s. The 4K read and write rates are good at 39 MB/s and 67 MB/s. 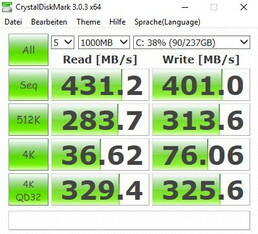 Other SSDs can be slower at times (see Apple MacBook 12 in the comparison table) and manage a mere 20 MB/s. 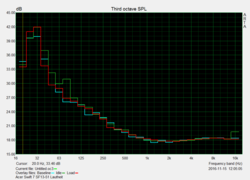 The performance of the SSD in our test model is quite good. However, the faster Samsung SM951 SSD of the HP EliteBook Folio G1 beats our model clearly. Despite the Acer Swift 7 taking last place in this segment, the laptop runs well and it is comfortable to use. The iGPU is no miracle worker. 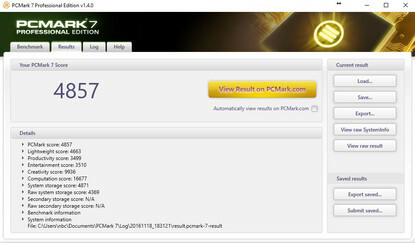 The Intel HD Graphics 615 chip of our test model performs at the same level as that of the Acer Spin 7. The HP EliteBook Folio G1 performs at a higher level thanks to its raised TDP value. The Intel HD Graphics 615 chip can decode H.265/HEVC and Google VP9 codec with the hardware, thanks to the Kaby Lake architecture. This is not one of the strengths of the Intel HD Graphics 615, as even older games have a hard time running on the Acer Swift 7. 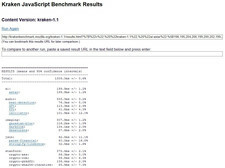 This performance is not surprising, as the manufacturer is limited by the flat build of this laptop. If you like gaming, you should look for an alternative to the Acer Swift 7 and all other comparison models. The Acer Swift 7 has a passive cooling system, which means that it will have no noise emissions from the fan. The test model runs silently, with small electrical noises interspersed here and there. However, these are so quiet, that they are only audible if you put your ear to the Acer Swift 7. 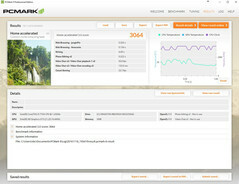 3DMark 11 after stress test. Despite passive cooling, the temperatures are reasonable. 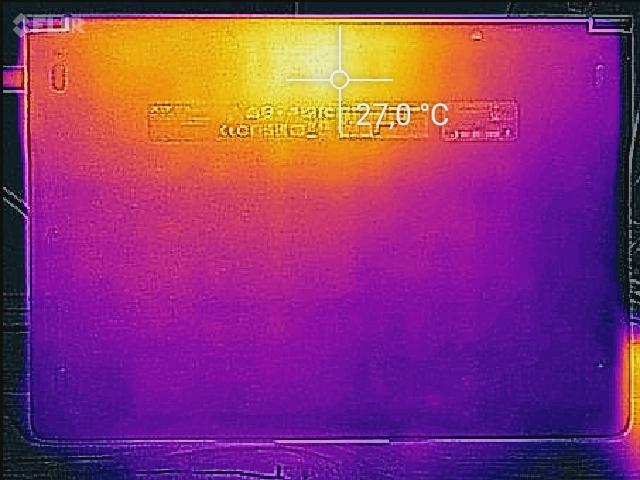 Under load, we measure 48.7 °C (~120 °F; bottom) and 45.7 °C (~114 °F; top). These values were measured near the back of the device, where the CPU, iGPU and RAM are placed. While idle, the Acer Swift 7 stays comfortably cool and the previously mentioned area stays within the 25 °C (~77 °F) zone. 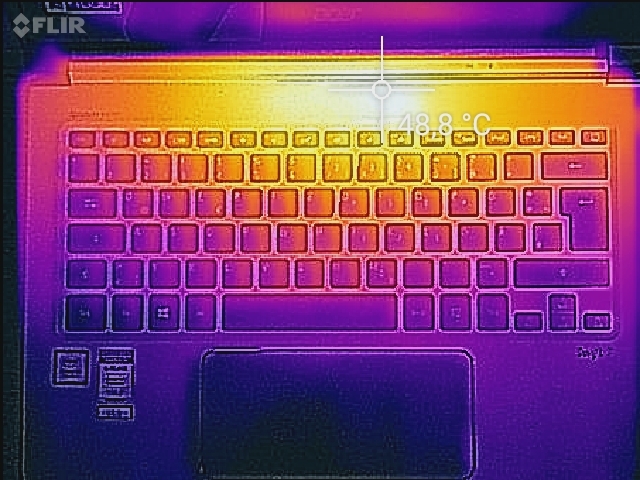 Inside the laptop, temperatures are slightly higher. After 1 hour of load using the Prime95 benchmark, we observed the CPU reaching a maximum of 68 °C (~154 °F). 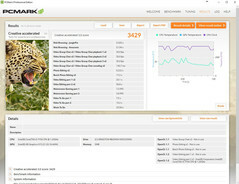 At the start, it runs at 2.8 GHz, but the clock speed is regulated quickly down to 1.7 - 1.9 GHz. 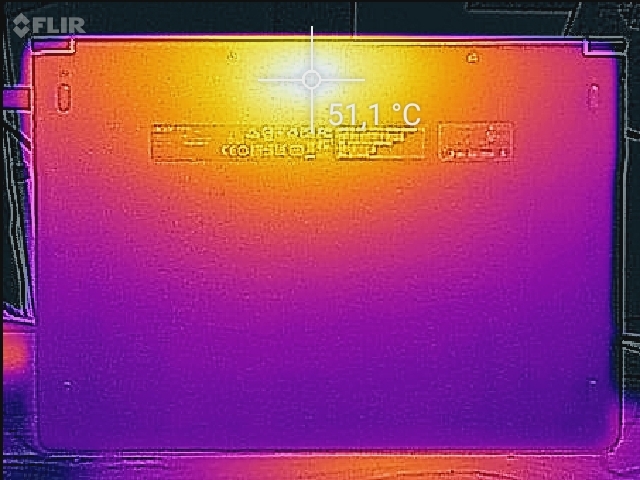 The iGPU heats up to a maximum of 66 °C (~151 °F). 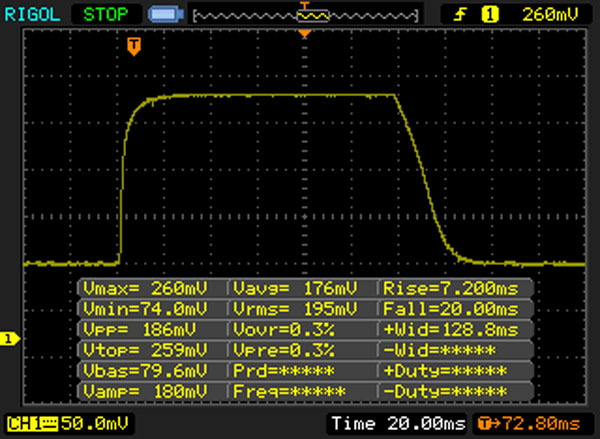 At the beginning, the iGPU runs at 950 MHz, but it quickly drops to 650 MHz, where it holds for the rest of the test. 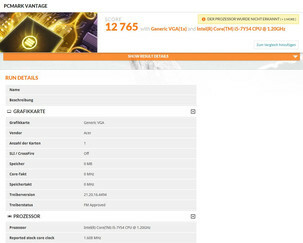 Right after the stress test, we ran 3DMark 11 again to measure any discrepancy in performance when the laptop is "hot". The difference is very slight compared to the performance offered by the laptop when it is "cool". This means that the temperatures will not have a lasting effect on the performance. 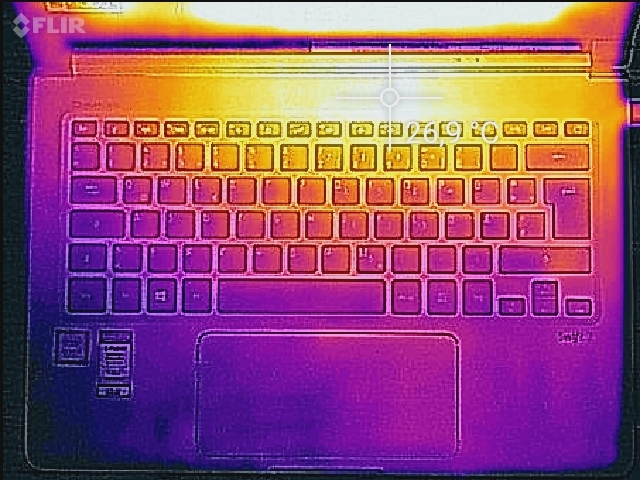 (+) In idle usage, the average temperature for the upper side is 23.4 °C / 74 F, compared to the device average of 30.7 °C / 87 F.
The two speakers are placed on the sides of the laptop and provide downwards output. This means that the sound quality depends entirely on what is below the laptop. 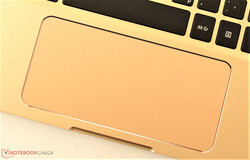 If the laptop is on a soft base, the sound is easily dampened and the volume is slightly reduced. Due to the limited space of the laptop, it is not possible to produce great sound. High and middle notes populate the majority of the output and the bass is barely noticeable. The volume is sufficient for home use. 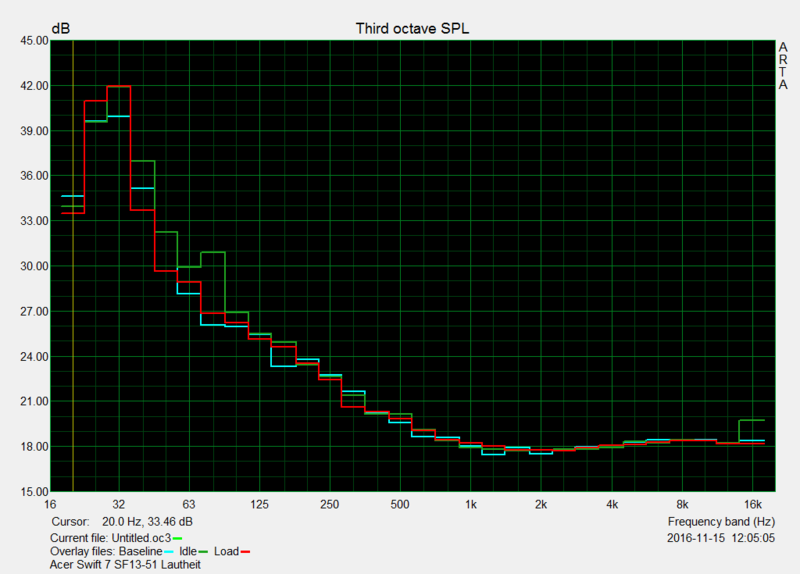 The sound output is clear, even at maximum volume. The dual-array microphone under the display border (near the Acer logo) works well as there is no fan to disturb recordings. ... to the left and the right of the battery. The bottom has an opening for the speakers. ... a USB Type-C connector. The consumption of the test model is decent. The laptop needs between 4.1 W to 18.7 W. While idle, the Apple MacBook 12 does a better job of keeping the consumption low. At load, the tables turn and the Acer Swift 7 is one of the least demanding at 16 W. The Asus ZenBook UX305CA needs a little less on average (0.1 W) than our test model. The power adapter of the Acer Swift 7 can provide up to 45 W. This means that the laptop has everything it needs, even at full load. The LiPo battery takes up most of the case. Considering the consumption of the laptop, we hope to see long battery life. The test model meets our expectations, but the Apple MacBook 12 can trump our model with its longer battery life. 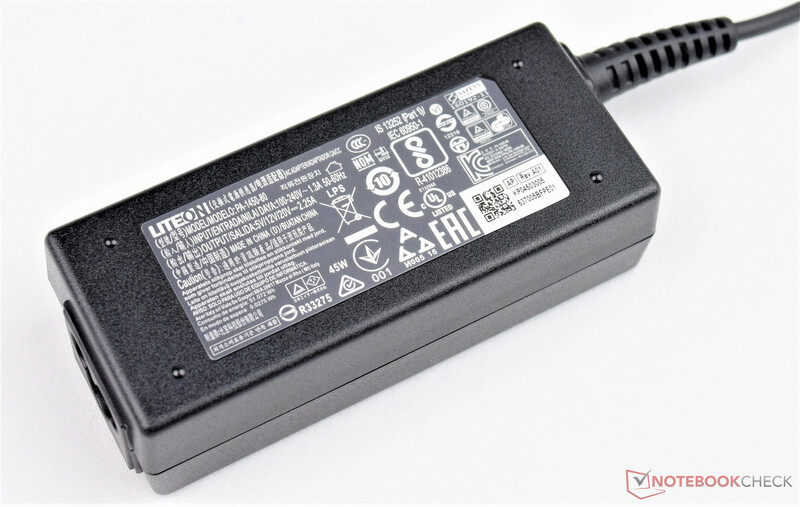 The Acer Swift 7 uses a LiPo battery with a capacity of 41.58 Wh. While idle, the laptop can run for 13:12 hours. At full load, the laptop is depleted after 3 hours. The WLAN test is more realistic. 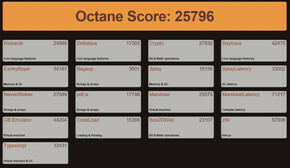 We run a script which loads a website every 30 seconds. The power profile is set to "Balanced" and the brightness is regulated to around 150 cd/m² (6 brightness levels from the max). With these settings, the laptop lasts 7:18 hours, which is quite good. The Apple MacBook 12 (8:21 hours) is the only competitor which lasts longer. In the H.264 test, our laptop lasts 6:50 hours, which is enough to see 2 or 3 movies. 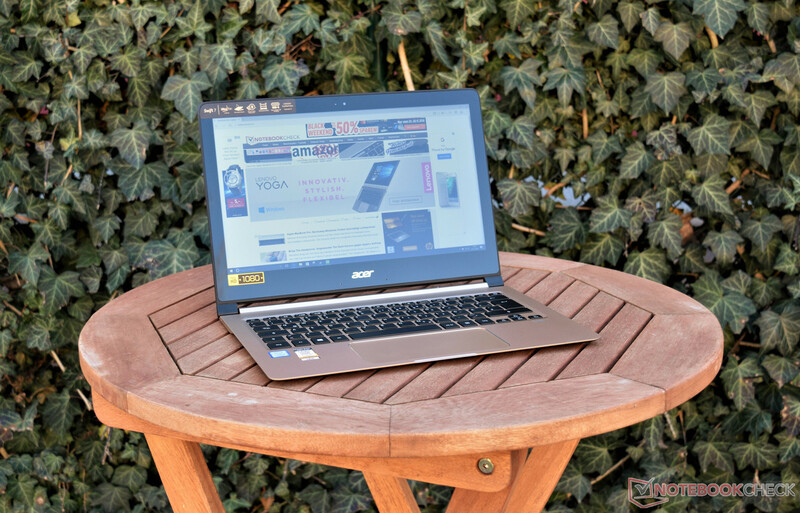 In review: Acer Swift 7. Test model provided by Acer Germany. At 9.98 mm thick (~0.4 in), the Acer Swift 7 is the slimmest model of the world. The black-gold color scheme looks nice and the case feels great. The super-flat construction is easy-to-handle. Overall, Acer has produced a good laptop. The workmanship is flawless and the performance is good (considering the limitations of the case). At the time of testing, this laptop cost 1300 Euros (~$1359). The Acer Swift 7 is a high-quality laptop, which was reliable in our tests and in use. The hardware is good and ensures that the system will run smoothly. 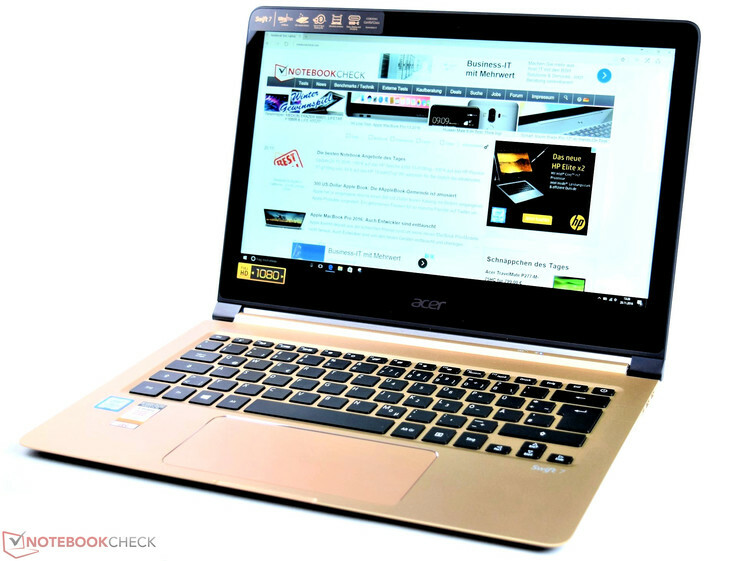 Buyers should be aware that the performance is a deciding factor for the Acer Swift 7. 3D games are hard to run on this laptop. Video editing is also not possible. These are definite weaknesses of our test model. However, this is also not the goal of the Acer Swift 7. The great IPS panel and low consumption/relatively long battery life (up to 7 hours) provide the user a portable, good-looking laptop.